Where can a developer find information about outbound dialing? Under Outbound Dialing, click Call Analysis Responses. 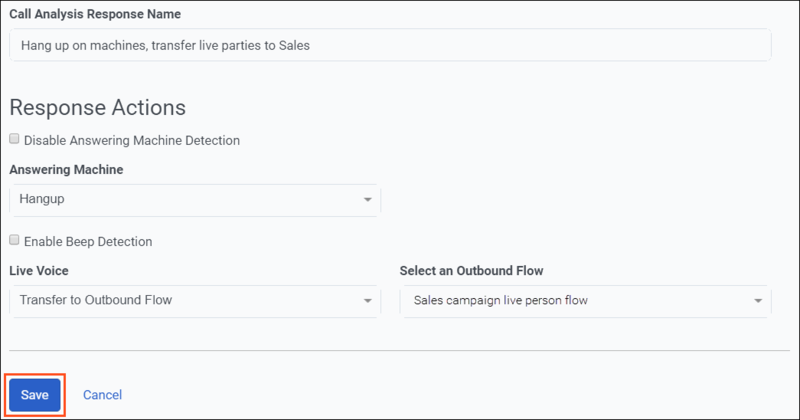 Transfer to Outbound Flow transfers to the outbound flow you select. Create outbound flows beforehand using Architect. (Optional) If you do not want the system to distinguish between a live voice and an answering machine, click Disable Answering Machine Detection. When the call connects, the system transfers it without evaluating for a machine. Note: An error message appears if the new call analysis response exceeds the maximum limit count of 1000. Delete old or obsolete call analysis responses as needed and click Save again to complete the new call analysis response configuration.